Vetasyl for Cats - Is It Effective Diarrhea Treatment? Vetasyl for Cats – Is It Effective Diarrhea Treatment? Is Vetasyl for cats effective at treating diarrhea? The answer will depend on the cause of the diarrhea. Vetasyl is available without a prescription, and is an all natural dietary supplement that can provide needed fiber and relief from constipation for your cat. Diarrhea is one of the most common cat sickness symptoms, and in some cases this supplement may actually resolve the diarrhea without the need for any medications. Vetasyl for cats is made from natural fiber sources, including psyllium and other plant materials, and this supplement has no side effects when used as directed. This product is very effective at establishing a normal bowel elimination regimen, because the fiber bulks up the stools of your cat. Vetastyl can help resolve several cat health problems, including constipation and hairballs. In many cases this supplement can help bulk up loose stools and diarrhea, but it may take a day or two before this is accomplished if you do not provide this supplement on a regular basis. 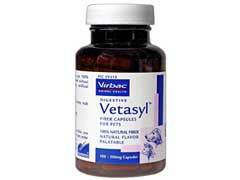 Vetasyl for cats is gentle, and can help regulate normal bowel movements without any harsh drugs or abdominal pain. Hairballs can result in gastrointestinal distress and a throwing up, but this supplement can help move hairballs through the digestive system of your pet so they can be eliminated. While Vetasyl for cats can minimize the occurrence of diarrhea in some cats, this condition can indicate a serious illness or other medical problem. If your cat has diarrhea for more than one or two bowel movements, or shows any signs of dehydration or distress, then your vet should be consulted. If you notice signs such as loss of appetite, nausea, or other troublesome symptoms your pet should be checked out thoroughly by the vet. Vetasyl may be a good treatment for diarrhea, but if this remedy does not work stronger measures may be needed.